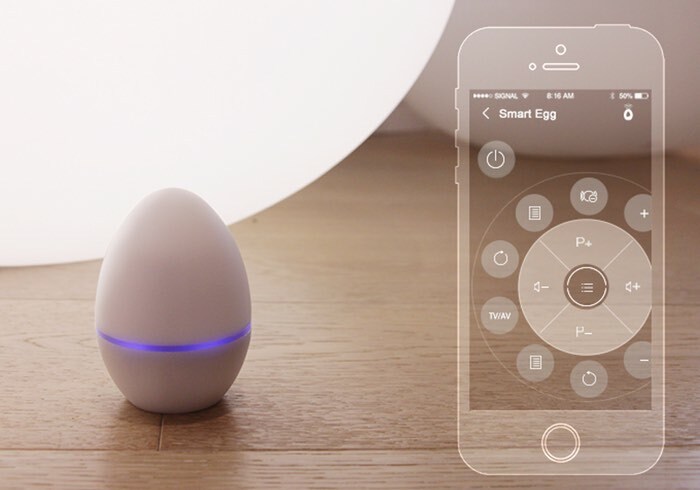 AICO Tech has unveiled a new universal remote system that it has created that uses a piece of hardware in the shape of an egg that has been aptly named the SmartEgg together with a companion application that can be loaded onto your Android and iOS smartphone or tablet. The SmartEgg has a database it can access with over 5500 remote controller maps and 125,000 infrared codes allowing you to be able to set up your universal remote control easily and effectively straight out of the box. Watch the video below to learn more about this new universal remote hardware that comes supplied with the ability to learn your preferences at an affordable price. Its creators explain a little more about the inspiration and design of the new all in one universal remote system. SmartEgg is backed with dynamic cloud database that already contains over 5500 remote controllers and 125,000 IR codes, and it keeps growing each day. It is able to emit more than 250 different IR protocols. With its high sensitive IR receiver and self-learning capability, you can use it for any vintage or brand new devices even if you are ‘lucky’ enough not finding one in our database. We understand that devices in your home (i.e. home theater) often work together. As SmartEgg stores all control keys of your home appliances, you can now combine any keys from any controllers to create your own scenes. Turn on TV and DVD, Switch to DVD Input, Eject DVD and Play, all these tedious steps can be completed in just one tap. Thanks to the latest Bluetooth 4.0 beacon technology, SmartEgg can track your mobile movement and position in your home. You can now trigger your scene by just walking into the desired range of the SmartEgg, up to 50m far at 0.1m accuracy. So you can take controls without awakening the phone. The SmartEgg project is currently over on the Kickstarter crowd funding website looking to raise $50,000 in pledges to make the jump from concept to production. So if you think SmartEgg is something you could benefit from, visit the Kickstarter website now to make a pledge and help SmartEgg become a reality.